A Frame Signs and Sidewalk Sign Frames are ideal and very affordable in advertising your message. 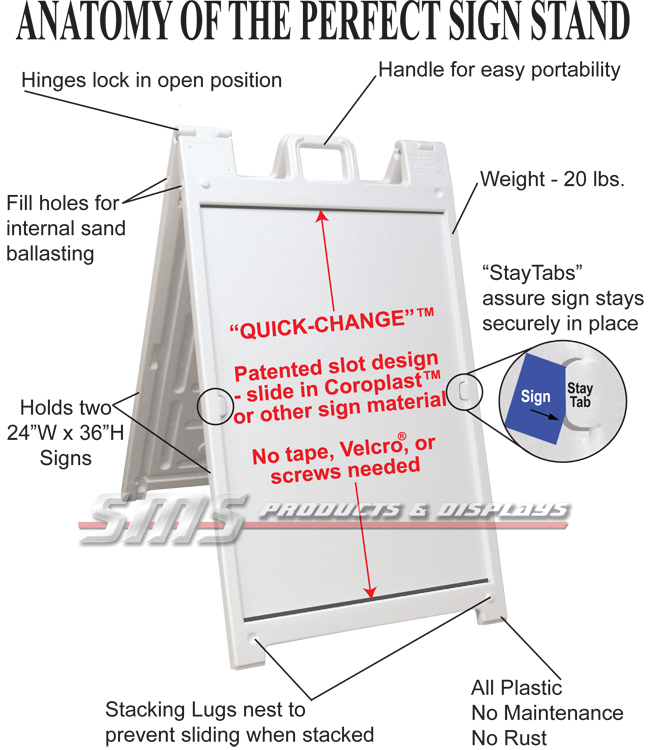 Direct passers-by into your retail location with our in stock Portable Sidewalk Sign Frames! A Frame Signs, A Frame Sidewalk Signs, Portable Sidewalk Sign Frames, Curb Sign Frames and Affordable Sign Frames are a cost effective form of outdoor advertising that can reach multiple target markets with minimal investment. Business owners and marketers realize now more than ever the importance of targeted messaging and product promotion. Whether you’re announcing a Company Rewards Program, a new product line, presenting event information, advertising a sale or strengthening your brand awareness, our extensive line of Steel, Plastic and/or Wood outdoor A frames are the perfect form of effective advertising. By adding Coroplast plastic or Aluminum inserts, these sign frames offer great exposure for your message. Our line of A frames are also available in hinged plastic sidewalk signs, Plasticade® A Frames, Signicade® A Frames and various Wind Resistant Signs are designed for easy selection that best suits your climate and usage. 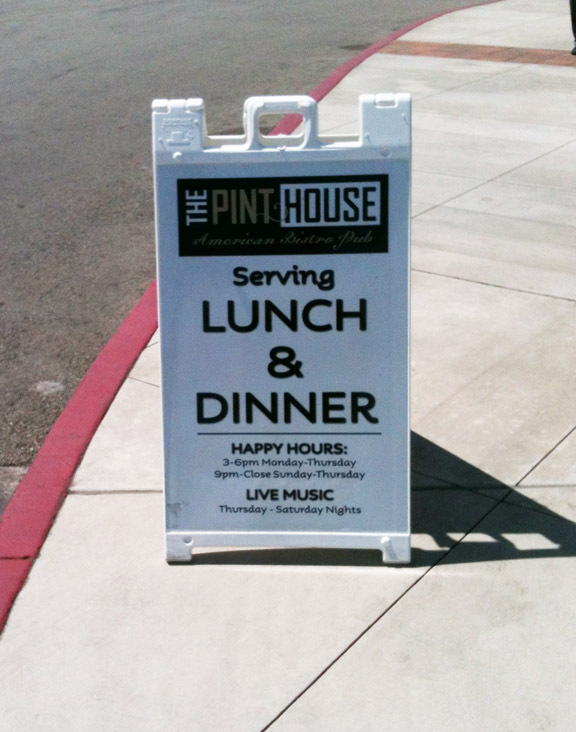 Sidewalk Sign Frames draw double sided attention to your business turning passers-by into customers! Small and large industries are maximizing these sign frames to passers-by and grabbing their attention. With so many benefits in utilizing the portable sidewalk sign frames and A Frames, the choice is simple! A one stop shopping experience with an all in one product selection from a real business that has real inventory. From printing and design to fulfillment we have all the solutions to meet your needs. Check out our blog! 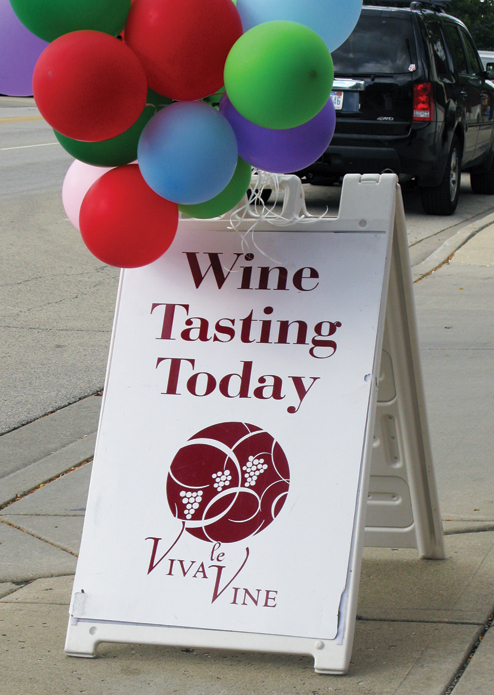 A-Frames for Restaurants and Retail Locations – sidewalk signs will turn a passer-by into a customer. Draw the attention of potential customers with advertising s pecials, menu announcements and upcoming events. Typical businesses that use these signs include retail stores with sidewalk frontage, clothing boutiques, coffee houses and Mall Stores. Many top restaurant chains have been utilizing portable outdoor advertising for years due to consistent positive results. Affordable signs can be changed quickly and easily so that employees don’t need specialized training to install signage. Change your signs frequently to keep the customers interested and curious about location details. Lightweight design allows employees to easily move outdoor a frame signs indoors at the end of the day. A Frame Sidewalk Signs for Real Estate and Rental Property Management – portable sign frames help in promoting the attributes of your rental properties as well as those on the market for purchase. A-frames easily point the way to new commercial and residential real estate developments. Cost-effective and informative, a-frames are a great way to get information to your potential customers quickly and to establish customer trust through consistent use of your logo. A-Frames for Special Events, Non-Profit Organizations and Schools – Churches, Schools, 5K Runs, Fema and many other top organization can optimize the versatility and durability of a-frames and portable sidewalk sign frames. These durable outdoor A Frame Signs are the perfect, cost-effective solution for your upcoming event. A-frame portability allows for easy transport and placement at your event site, offering visibility and guidance for your attendees. Directional signage and event schedules will be easy to follow with strategically placed portable a-frames at your convention, course or event location. Inexpensive portable a-frame signage will help establish logo recognition and spread awareness. A Frame Signs elegant sign frame ideal for Quick change signage. Sidewalk A Frame holds 2 ea. 3/16"thick x 24"wide x 36"tall sign (NOT INCLUDED). Portable Sidewalk A Frames are ideal for advertising your business to potential customers.